Cosina Voigtlander 15mm f4.5 Super Wide-Heliar lens mounted to a Sony A7r via a Voigtlander VM Adapter II. and Voigtlander L39 to M mount adapter. 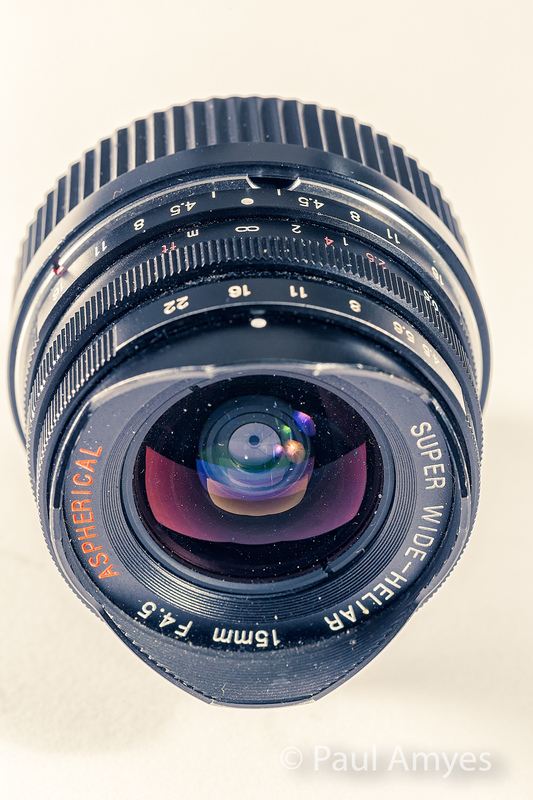 I’ve been meaning to write a review of this lens for a long time – well over a year in fact – and it has proven difficult for a number of reasons which will become apparent as we proceed. In an ideal world all lenses would be wonderful for every possible use we put them to, and to be fair with modern lens their computer aided design makes this happen for the most part. Things get sketchy when we are dealing with older designs on modern digital cameras. 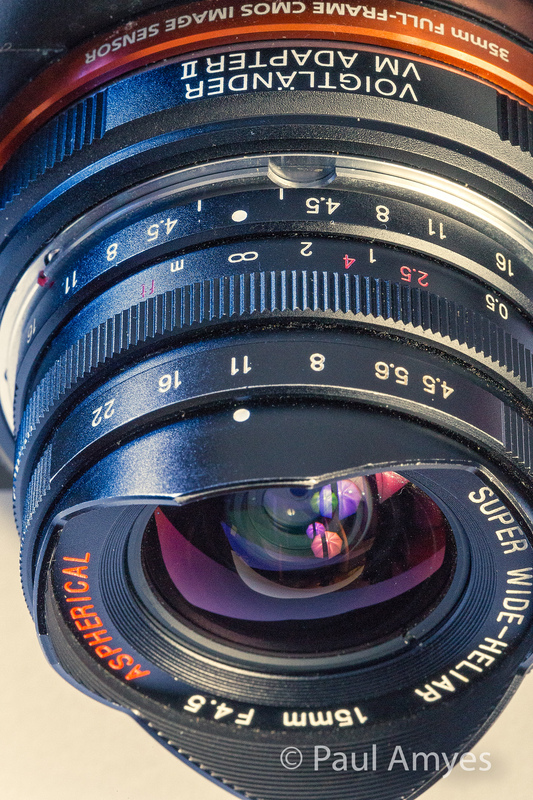 High resolution digital imaging has placed a great deal of strain on lenses. With film only a few people had the time, ability, resources and inclination to examine the optical performance of lenses. This was largely the province of a few magazines (remember them?) and they would accompany a review with a couple of graphs which would reference the resolving capabilities with fine grains low ISO black and white films developed in special developers designed to minimise grain and maximise acutance. Now anyone can open up an image in Photoshop and zoom into 200% and see a lenses faults. This is why Canon, Nikon and independents such as Sigma are going through their catalogue of lenses and updating them, and this need for optical improvements explains why lenses are getting bigger, heavier and more expensive. Back to the matter at hand. The video below is the short version. Cosina Voigtlander 15mm f4.5 Super Wide-Heliar Lens. 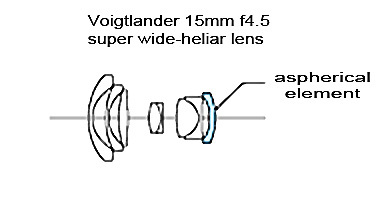 The Voigtländer 15mm f4.5 Aspherical Super wide-Heliar to give its full name is really the antithesis of modern lens design. It is small, light, affordable and not heavily optically corrected. But having said that this is the lens that really put Cosina’s re-launch of the Voigtländer brand on the radar of photographers. I can remember when this lens first came out a friend of mine borrowed one and ran around madly shooting roll after roll of film with a silly look on his face enthusing about it wildly. Up until then the widest lens in Leica M mount was the Zeiss 15mm f8 Hologon of which only 225 were made and currently change hands for around the $10,000 USD for one in mint condition. The Voigtländer 15mm f4.5 is now discontinued but can be obtained as new old stock for approximately $600 USD, or second-hand on Ebay for around the $400 USD mark at the time of writing. Cosina Voigtlander 15mm f4.5 Super Wide-Heliar lens showing the Leica L39 screw mount. 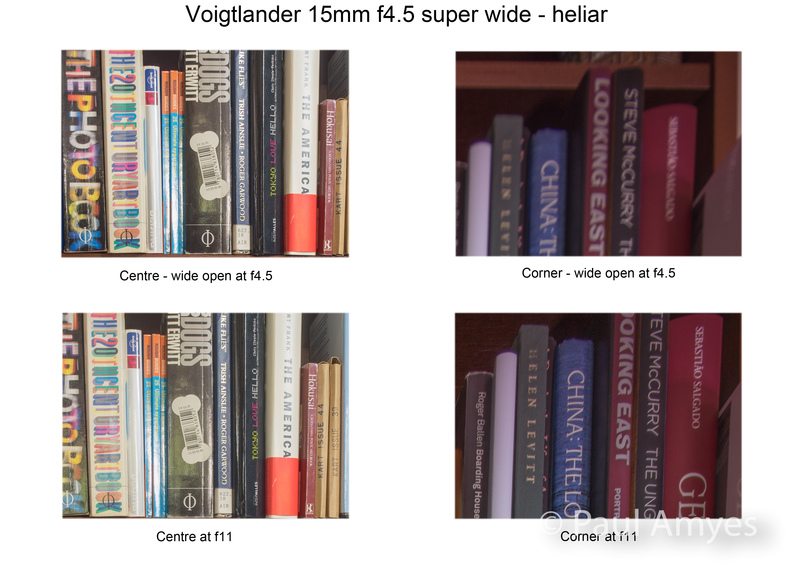 Cosina Voigtlander 15mm f4.5 Super Wide-Heliar lens showing the Voigtlander L39 to M mount adapter. Cosina Voigtlander 15mm f4.5 Super Wide-Heliar lens showing the Voigtlander VM adapter II Sony E mount adapter. The lens is very well made – up to Cosina’s very high standards and it has, despite its diminutive size a solid feel and satisfying heft. The aperture ring is at the front of the lens, as is usual with rangefinder lenses, and turns nicely with satisfying half stop click indents. The focusing action is very smooth and has an approximate 100º throw. I found that I tended to use hyper focal distances to zone focus the lens in use as the short focal length means that the DOF is immense. The lens has a very clearly marked scale to make this easy. An aperture of f8 means that everything from 0.5m to infinity is in focus. Conversely lovers of shallow depth of field should really be looking elsewhere. 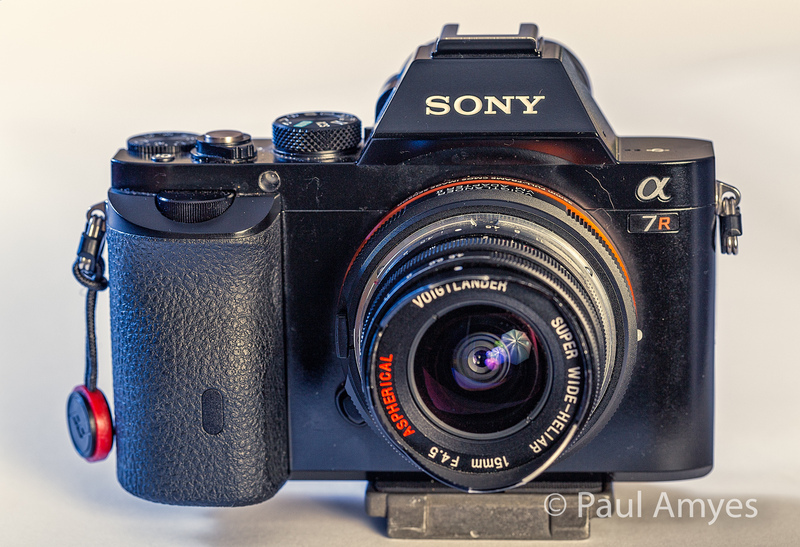 Cosina Voigtlander 15mm f4.5 Super Wide-Heliar lens mounted to a Sony A7r via a Voigtlander VM Adapter II. Years ago Clint Eastwood made a film called “The “Good, The Bad, The Ugly” (a movie which had the coolest theme tune ever, actually that is an exaggeration as everyone knows Shaft had the coolest, but it’s a close run thing) well this lens is all three. Good, bad and ugly. The good comes when you use the lens as intended on a film rangefinder body. The bad when you mount it on a digital m4/3s body and the ugly when you put in from of the A7r’s 36Mp sensor. This lens is one of the worst I’ve ever had on a digital camera – the worst was a $20 25 mm f/8 Holga lens in m4/3s mount which I tried using on my Olympus EP2 several years ago, but that is, as they say, another story. My friend who I mentioned earlier abused Kodak Tri-X by pushing it, developing in Rodinal and then lith printed the results. He wouldn’t have noticed what I’m about to describe. 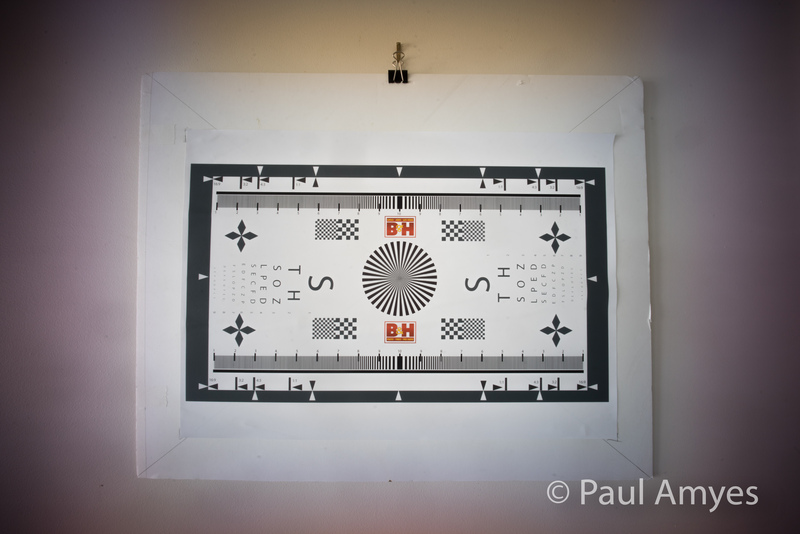 So this is how it was on the Sony A7r.Right from the get go there is obvious barrel distortion. Wide open there is considerable vignetting which has a very obvious magenta cast. No matter how far you stop down this does not go away (kind of like Mormon missionaries on your doorstep). Wide open the centre sharpness is quite good and remains so until f22 when diffraction rears its ugly head. The corners are smeared and out of focus, things improve a little by f11 but they never get to the level of sharpness of the centre of the lens. Chromatic aberration is also present throughout the aperture range. Flare for such a wide lens is remarkably well controlled and lovers of sunstars should be happy as the 10 aperture blades produce nice results. With film the light-sensitive silver halide crystals don’t care at which angle light hits them. The reasons for this are that Voigtländer 15mm was designed for use with film and the silver halide crystals in the film emulsion did not care at what angle lights hits them to provide the necessary reaction to form the latent image. But with a digital sensor it is a whole different ball game because the sensor is no longer just a gelatine substrate coated with an emulsion containing silver halide crystals it is a complex sandwich of filters, lenses and electronic componentry as the schematics show. For best performance the light needs to enter micro lenses at 90º, when the incidence of the light is severely off perpendicular then not all of it reaches the pixel at the bottom of its well this can cause vignetting, smearing with loss of detail, and severe colour fringing. This is what stopped Leica initially developing a digital range finder. Kodak developed a special sensor with offset micro lenses for Leica to help overcome this along with in camera software correction the digital M became a reality. For light to hit the pixel in its well it needs to travel as near to perpendicular to the sensor plane as possible. For stills photography the 15mm f4.5 could be a consideration if you don’t have the current fixation of razor sharpness corner to corner i.e. if the hero of your shot is central to the frame and you don’t mind loss of sharpness at the edges. Working in monochrome would help get rid of the magenta cast of the edges as well. Have said that the magenta cast and vignetting are removable in post, the accompanying video shows how this can be done in Lightroom. In the gallery of example pictures below I’ve left the magenta cast in some of the photos so you can see what it looks like. If you’d like to see the photos larger they can be seen here. Video is another matter. Ideally this lens should be perfect for vlogging on a Sony A7 but the smearing, colour cast and vignetting make it quite unsuitable. Also it has no filter threads so it is impossible to use a variable neutral density filter which further adds to its unsuitability. To be completely fair we are demonstrating uses for this lens that it was never designed for. With film and optical/chemical printing it is an amazing lens at very cheap price. When looking at it from a digital imaging point of view, whether stills or video, it really can’t be recommended unless you already own it and are prepared to put up with its short comings. If you are looking for an ultra wide the are better options available such as the Laowa 15mm f/2 Zero-D Lens.